Tight end is notoriously thin in fantasy football, but the position just got slightly more interesting with the news that Jared Cook is expected to sign with the New Orleans Saints. Cook is coming off a career year with the Raiders last season, setting highs in yards (896), catches (68), targets (101), and touchdowns (6). He finished the season as fantasy’s No. 5 tight end. In New Orleans, Cook joins a Saints team that has been void of a viable fantasy tight end since Jimmy Graham left for Seattle back in 2015. Graham was followed by a series of disappointments that included Coby Fleener, Josh Hill, and Benjamin Watson. Despite the hype that surrounded these players, none of them were able to get it done for fantasy purposes, save for a stretch of Watson production in 2015. Of course, the team is very different than the Graham-era Saints, but there’s still opportunity for Cook to produce on this depth chart. Michael Thomas and Alvin Kamara dominated the workload last season with a combined 50% target share. However, beyond these two, Ted Ginn was the only other player to see a double-digit share, at 15% when he was on the field. Watson was the most heavily targeted tight end with a 9% share. That’s roughly 10% lower than the 19% share Cook saw in Oakland last season. Expecting Cook to continue to see the same workload in 2019 is a bit ambitious, but it’s reasonable to consider him the No. 3 option in the pecking order. In that role, a 16% share is a fair projection. But again, this isn’t the Saints of half a decade ago. The team’s more run-heavy approach has led to a significant decline in passing attempts. We used to be able to ink Drew Brees in for 600-plus attempts, but he hasn’t topped that plateau since 2016. Last year, New Orleans attempted just 519 passes, which ranked 23rd in the league. That projection adds up to 146.1 PPR points, which is a certainly a dropoff from the 193.6 points that Cook scored last season. That being said, this total would still have ranked in the top-10 among tight ends last season. While it’s tempting to view this landing spot as a big upgrade for Cook, we have to be cautious in our evaluation. This is not the Jimmy Graham era. The Saints’ transition to a more run-based offense means fewer targets are on the table. That being said, getting to play with Brees is obviously a good thing. 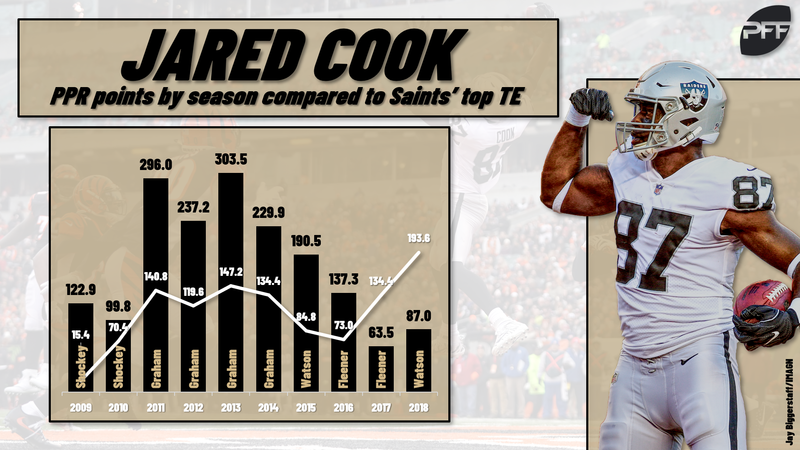 Cook is best viewed as a back-end TE1 with a high weekly ceiling. He’s a very intriguing best ball option.